Collage is an art form that employs all kinds of materials: magazine pictures, photos, lace, shells, wood, tile, mirrors, wallpaper, wire-- whatever is of interest. The resources are almost endless! 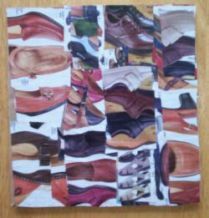 In my "Shoe Collage" I used pictures from a shoe catalog in a repeating pattern that made this composition other than just pictures of shoes--stacked images created a strata of similar shapes and colors that became a quilt-like design. Collage is a creative method of collecting a variety of materials and exploring how they might be put together into a composition that transforms the original images into a new visual form. Today, collage is considered an established art form and often evokes a provocative visual reaction from viewers for the magical way common, everyday objects have been magically transformed into a composition that gives them new meaning. Making a collage requires visual and physical abilities. In creating new combinations of common images (brand logos, ads) or combining a variety of objects (shells, leaves) the objective is to create a new environment for diverse materials, exploring ways of combining them and working towards creating a unique composition that expresses a personal view. Making a collage using two dimensional materials such as magazine pages, stamps, wallpaper, etc. requires minimal art supplies--basically scissors, glue and cardboard or mat board. My collage lessons deal mainly with these kinds of materials. Watch my video "Introduction To Collage." I explain the six collage lessons course and what you can expect to learn. Click here to start the FREE Collage Lessons. Also I introduced my daughter to your art lessons and she is delighted, especially with the stencil one of the fishes! You encourage people of all skill levels to feel less intimidated by the thought of actually 'doing' a painting! Anyway, just saying thank you and to let you know how much we enjoy Charlie as well. I have been drawing all my life as far back as I can remember. I saw your free art classes online and book marked them and when I have more supplies am going back. I'm starting to work with the landscape. As son as I have ir done I'll send you the picture. Best regards and thank you again.